It’s Speedy Tuesday and today we put this stealth Speedmaster Professional Apollo 11 limited edition in the spot lights. Stealth? Yes, as it appears to be a regular Speedy Pro ‘Moonwatch’ until you take a closer look at the caseback. 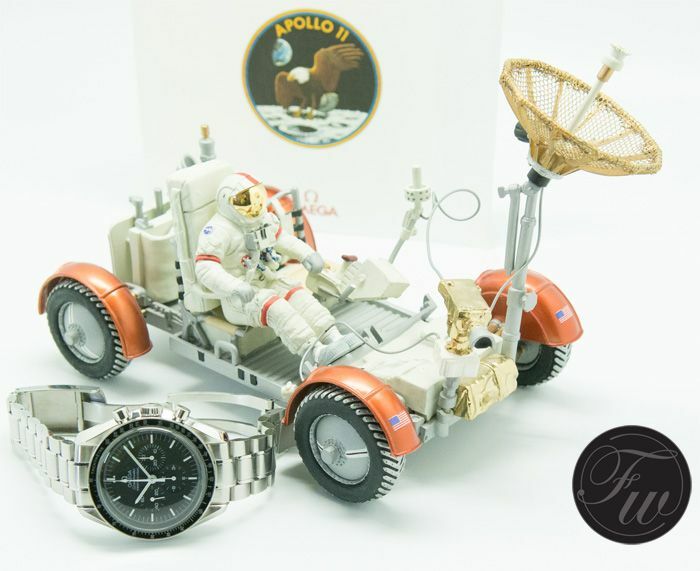 The special engraving tells you that this is a limited edition (9999 pieces) to commemorate the Moonlanding on the 21st of July 1969, at 2:56 GMT. This Speedmaster Professional Apollo 11 ref. 3560.50 (or ST 345.0223) was introduced in 1999 for the 30th anniversary of the Apollo 11 mission in 1969. 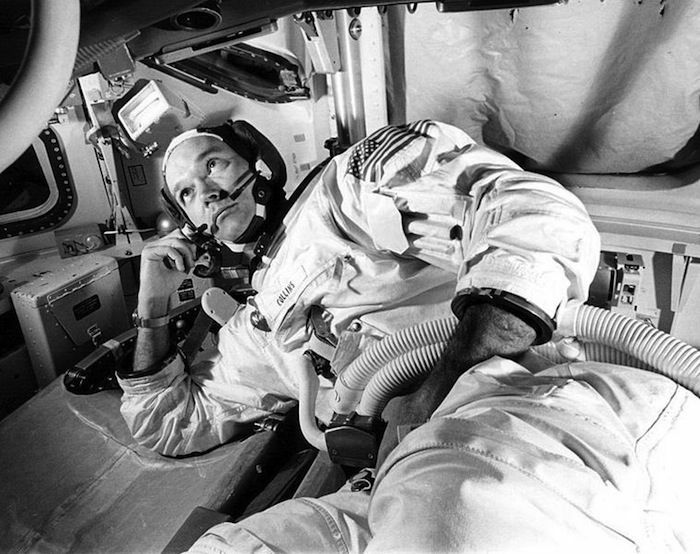 During the Apollo 11 mission, astronauts Michael Collins, “Buzz” Aldrin and Neil Armstrong were all wearing Speedmasters. However, there seems to be a bit of uncertainty on who’s wearing which one. In this article I did a few years ago, I wrote that Collins was wearing a 145.012, Armstrong a 105.012 and Aldrin a 105.003. 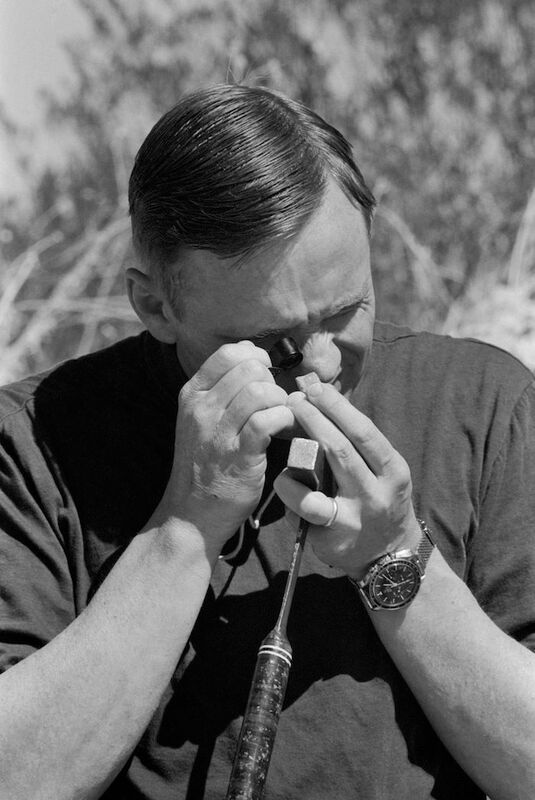 This info was based on information that the late Speedmaster collector Chuck Maddox received from OMEGA. 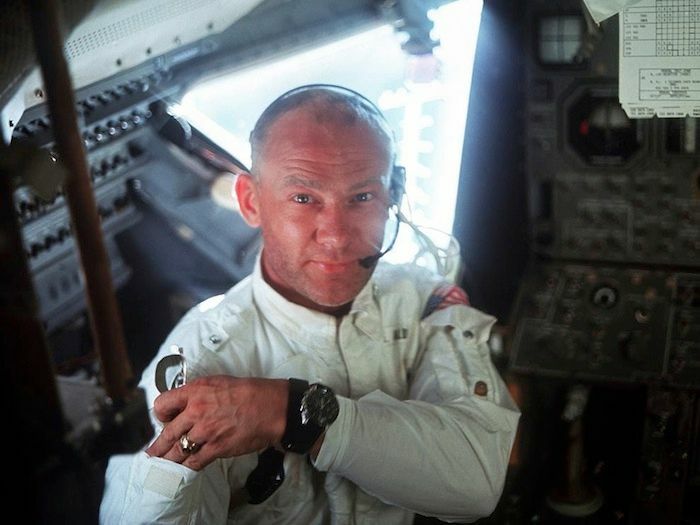 However, on the picture below, you can see Aldrin wearing a Speedy that seems to have crown guards. In a past Speedy Tuesday article, we zoomed in on the differences between these pre-Moon Speedmasters and the actual Speedmaster Professional ‘Moonwatch’ that is in the current OMEGA collection. I suggest you give that a read if you are in the market for a Speedmaster and still deciding between a vintage model or a Moonwatch from the current collection. 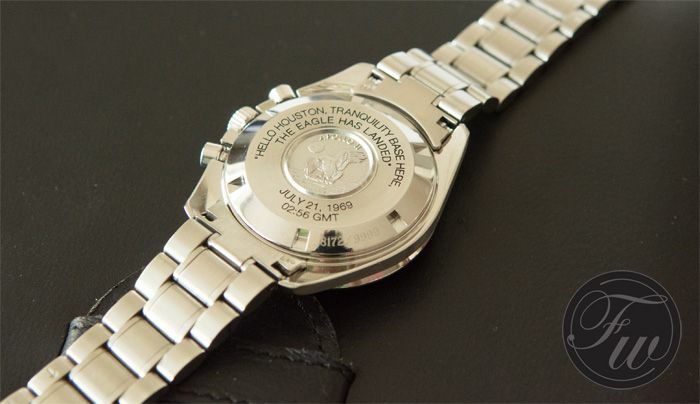 Most limited edition Speedmaster Professional watches have an engraving in the left side of the case, a (mission) patch on the sub register at 9 o’clock or a bit of extra wording on the dial to indicate it is a limited edition or commemorative Speedy. This Speedmaster Professional Apollo 11 30th Anniversary ref.3560.50 watch has neither, only an engraving in the caseback. 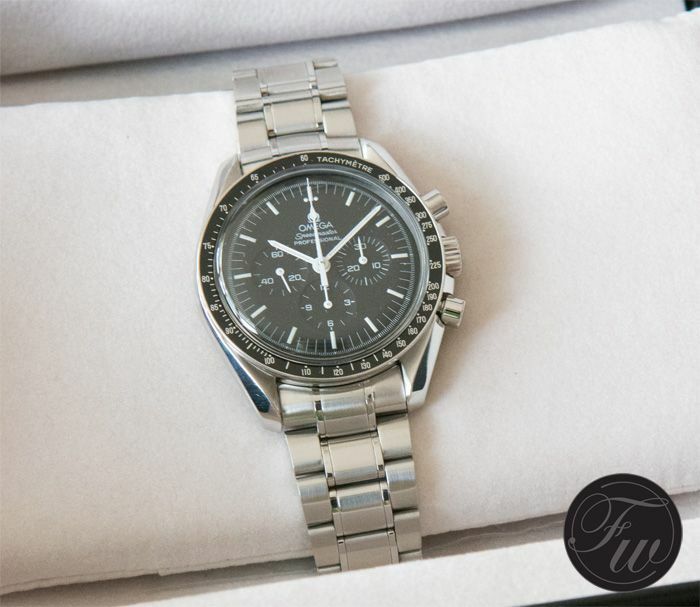 So, at first sight, there is nothing special about this Speedmaster Professional Apollo 11. Could be a regular 3570.50 Speedy Pro. 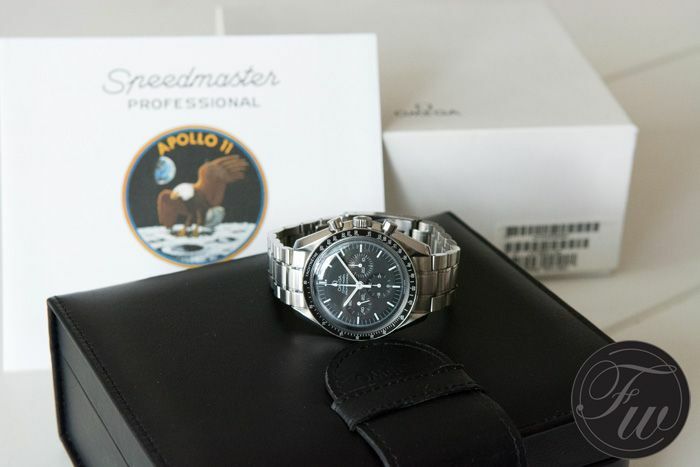 However, if you turn the Speedmaster Professional Apollo 11 over, you will immediately notice the special engraving and the embossed Apollo 11 mission patch where normally the Seamonster resides. The case back has the wording “Hello Houston, Tranquility Base here, the Eagle has landed”. Famous words that Neil Armstrong spoke when they landed on the Moon. Besides this special case back, the watch came with a black leather box with a bit different dimensions than the regular red leather box. Also, the Apollo 11 30th Anniversary Speedy Pro came with a certificate with some words on the Apollo 11 mission and the number of the particular watch (out of 9999 pieces). This Speedy Pro Apollo 11 30th Anniversary comes with a reference 1498 bracelet (end pieces are of type 840) which looks very similar to the current bracelet except for the fact that this one tapers a bit and has no pushers to release the clasp. However, the lay-out of the bracelet is identical: three brushed links and two polished links next to the center link. With 9999 pieces, you should be able to find one of these Speedmaster Professional Apollo 11 watches. However, limited edition Speedmaster Pro watches have been increasing in value over the last few years. I can’t remember the exact list price of back in 1999, but prepare to pay (much) more than +/- 1600 Euro they were at the time. The one we show you in this article is for sale at a local watch shop in The Hague (The Netherlands) that specializes in new, pre-owned and vintage pieces. The price tag on this particular Speedmaster Pro Apollo Limited Edition is 3150.- Euro. Click here for more information. Thanks to Michael of the Watch-Site store in The Hague for lending this watch to us for this article.